The Dragon Li, also known as the Chinese Li Hua, China Li Hua, Li Hua, Li Hua Mau, Li Hua Mao and 貍花貓 (in Chinese character), or simply Li Mao is of Chinese decent. This Chinese breed of domestic feline originates from the dynastic culture and ancient Chinese folklore. Dragon Lis are believed to be a natural breed, meaning they are a single breed, and not a combination of multiple different breeds. In 2003 the Li Hua debuted as an experimental breed class in Beijing, China December 30, 2003 – January 6, 2004. In February of 2010, the Dragon Li was officially accepted into the Cat Fanciers Association (CFA), as a miscellaneous breed. The Chinese Li Hua is believed to be one of the oldest domestic breeds, based on it being mentioned throughout ancient Chinese literature. The closest link to the Dragon Li is the Chinese mountain cat. When the Li Hua first appeared in China, people would mistake it as a fox. This was so common, they included the Chinese symbol for fox when naming the Li Hua. It was once thought, that these cats were supreme rulers of the land, and were even able to speak. It’s believed that the cats gave up their power and speech to live easier lives, where humans would serve their every need. A Dragon Li usually weighs between 8 and 12 pounds (3,5 – 6 kg). 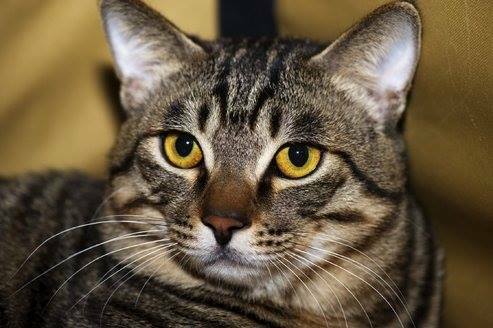 The Chinese Li Hua is predominantly a brown and black tabby, with big rounded eyes that are either green, brown or yellow. This breed has very distinctive markings. The Dragon Li has black rings around its tail and legs and black necklace on the neck. The end of its tail is solid black, and its belly is a combination of brown and yellow. The ticked hairs are black at the root, light yellow in the middle and brown at the tip. The Dragon Li also has distinct markings on its face and belly. There are black lines going from its eyes that curve down to below its mouth. The Chinese Li Hua has two black markings on the upper corners of its mouth that almost makes it appear to be smiling. On the belly there is a combination of leopard like spots, two vertical and four horizontal. The Dragon Li’s ears resemble those of a Bobcat, medium in size with a pointed tip. The Dragon Li has a wide muscular body with a slightly shorter tail. A Chinese Li Hua grows at a slow rate, it may take anywhere up to three years until it reaches its full size. The Chinese Li Hua is known for its superior intelligence. The Dragon Li is very gentle with humans, and typically good with children as well as other animals. In contrast to its relation with people, the Li Hua is an impressive hunter of smaller rodents and household pests. They are highly in tune with their environment and act accordingly. It is exceptionally easier to teach the Dragon Li tricks, than it is for most breeds. It has been said, that a Dragon Li has even been trained to retrieve a daily news paper. The Li Hua possesses a perspicuous, clear and effective, relationship with humans. However the Dragon Li is not an overly affectionate or vocal breed. Although the Li Hua likes to play and be around people, it is also known to be a bit of a loner. It will spend hours at a time by itself. The Li Hua is pretty well self sufficient. Their short coat is easily groomed, brushing once a week is enough. The Li Hua’s ears should be checked weekly, any buildup should be removed with cotton ball or soft cloth. An even mixture of water and apple cider vinegar works wonders in a cats ears, don’t worry it is completely safe. This breed should be kept inside at all times, due to the natural dangers that come along with being outside, and the rarity of the breed. Dragon Li needs enough space for living and feels bad in the smaller space. Who Should Own a Chinese Li Hua? This breed is truly for any cat lover. It will adapt well, regardless if there are other animals or children present. They don’t require a high level of maintenance and aren’t overbearing. Anyone looking for a cat that will fit into any lifestyle and surroundings the Chinese Li Hua is hands down the breed to go with. Depending on the type of Li Hua the average price range is between 400 and 900 dollars.